Oil Sand Box: Could oilsands crude be shipped in the Atlantic sooner than the Pacific? Could oilsands crude be shipped in the Atlantic sooner than the Pacific? A map of the Portland-Montreal pipeline. From the surprisingly detailed Wikipedia article. So what will be the first port to put oilsands crude on the water (not to be confused with in the water, knock on wood)? Well according to this article, if the Portland-Montreal-Pipeline company has anything to say about it, it might be in Portland, Maine, that bitumen finally takes to the seas. It's a bit confusing, but it appears the company is owned by Suncor, Imperial and Shell. Presumably, this reversal will change the name to the Montreal-Portland-Pipeline company. Since www.mppl.com is currently occupied by a blank page, maybe that's exactly the plan. However, since that site is registered in the British Virgin Islands to an apparently defunct company called "CDN Properties", maybe they haven't thought this far ahead. The history of the pipeline is pretty interesting. It was originally built in World War 2 because it wasn't safe to transport oil along the Saint Lawrence due to German submarines. The pipeline has transported 4 billion barrels of oil to Montreal over its lifetime, and is the reason Portland is the biggest oil importer on the American East Coast, according to Wikipedia. According to the article the line is currently operating well under-capacity. The buried 236 mile, 240,000 barrel per day capacity, line currently carries oil imported into Portland to refineries around Montreal. So two physical things stand in the way: the line needs to be reversed, and there's currently no way to get oilsands crude to Montreal. The first problem appears to be the smaller one, and PMPL says they've already spent $6.5 million preparing for line reversal. The second problem is a stickier situation of two parts. Problem 2a: oil must physically get to Montreal. 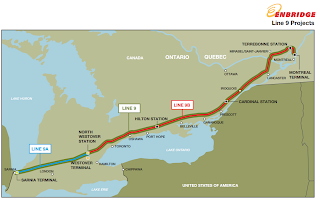 Enbridge wants to do that by reversing its "Line 9" to carry oilsands crude from Sarnia (via North Westover) to Montreal, as well as expanding it to 300,000 barrels per day. See map. 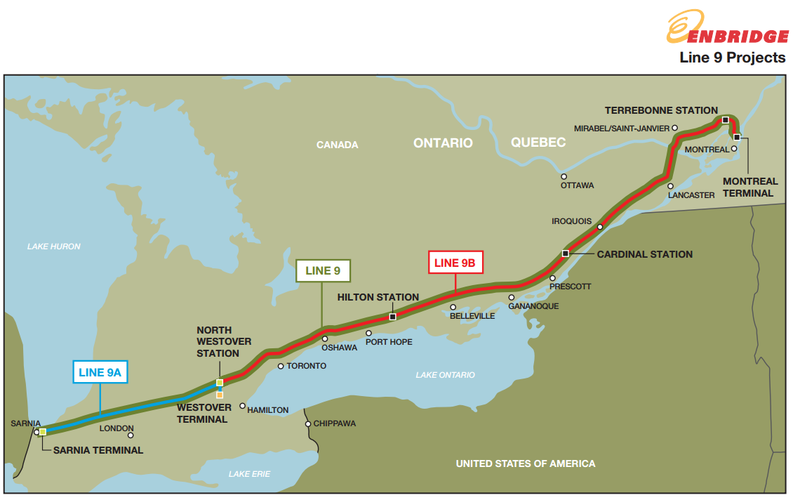 Enbridge's Line 9. From the Enbridge site on the pipeline. Problem 2b is that as of the last survey Quebec is the most hostile province in Canada when it comes to the oilsands. That is particularly the case for pipelines crossing Quebec. Here is an article describing the trust issues Enbridge has in Quebec. So which coast do I think will see bitumen first? Had this been a few weeks ago when the NDP was looking to win the provincial election in BC, I'd have said the Atlantic, if not through Portland then through somewhere else. But now that the Liberals have been re-elected in BC and are making somewhat friendlier noises about pipelines, it's not so clear. First Nation opposition and land-claims may sink pipelines like Northern Gateway; I'd say it's currently a toss up. Or I suppose it could never get to either coast, and we'll be locked into exporting solely to the US forever. They don't need approval or permits to transport oil via rail to Kitimat or Vancouver. The same goes for the Atlantic or Gulf coast. BC officially opposed the Northern Gateway on Friday, but is supporting Mr Black's Kitimat refinery/pipeline plan. It sounds like the First Nations might even join him, since they can't stop rail shipments and he's apparently offering substantial equity stakes in the pipeline. With $25 billion in loans being offered by China and the ability to leverage cheap Asian labor for modular construction (being on the coast), this option is looking like a contender. On another note, if any of the proposed pipeline options can make it to a Canadian port, then we are better off. The bigger problem is what do we do if we can only make it to US tide water? That's the case with this Montreal-Portland pipeline, Keystone expansion and the Seaway line connecting Cushing to the Gulf. They seem like good solutions to relieve the glut in oil at the Cushing Hub and therefore Alberta. A bit of an overlooked problem is you can't export crude from the US and the Jones act makes it incredibly difficult to ship crude oil domestically via tanker. This makes connecting to Canadian tide water in substantial volumes all the more important, unless the US makes some legislative changes. Lets hope the Transmountain, Northern Gateway and TransCanada's main line conversion to oil all go ahead. The sad thing is, that even if every proposed pipeline is built, there still won't be enough capacity for every proposed oil sands project, let alone any growth in conventional/tight oil production in the WCSB. Unfortunately there are always going to be losers (Sunshine, Connacher, Alberta Oilsands? ).